in support of Girls on the Run NYC! Run 13.1 miles through Central Park & Times Square with us on March 17, 2019, and help us inspire girls! The SoleMate experience is not only rewarding, but also a unique volunteer opportunity! 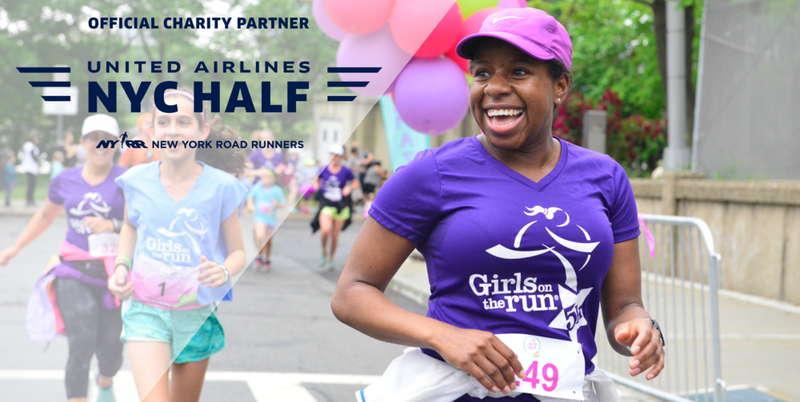 Train for the 2019 United Airlines NYC Half Marathon while raising funds for girls in New York City. Your support through fundraising is a tremendous gift, allowing us to expand Girls on the Run NYC scholarship sites and reach more girls. Currently, more than 60% of the girls in our program come from low-income communities. Funds raised by SoleMates allows these girls scholarship and subsidy support to participate in our life-changing program, empowering them to be confident, healthy and joyful. Your support will help Girls on the Run NYC maintain our commitment to serve all girls, regardless of financial need. A training plan for your race distance along with invitations to monthly group training runs and cross training sessions! Fundraising ideas to help you surpass your goal, including individual support from our SoleMates Committee and team ideas from your fellow SoleMates. Great Girls on the Run NYC gear and rewards, including a special singlet for race day! If you already have your own entry into the 2019 NYC Half Marathon, and would like to raise funds for the Girls on the Run program in New York City, and are not seeking Guaranteed Entry into the race, please proceed by selecting the 'I already have entry into the NYC Half Marathon!' option. We ask that you fundraise $500 for Girls on the Run NYC, and you can set your goal even higher! You are not held to a fundraising commitment if you have your own entry. 2019 NYC Half Marathon SoleMates Team! Click on a SoleMate’s photo to learn why they run for Girls on the Run NYC! E-mail our Co-Volunteer Directors of SoleMates, Gloria Noel & Annie Quinn, at solemates@gotrnyc.org!